Beginning May 15, Tempe will join Phoenix and Mesa by offering public bicycles that can be rented through the Grid Bike Share program. Tempe’s system will include 300 bikes, 425 racks and 30 stations, offering another alternative to residents and visitors for getting around the city with ease. 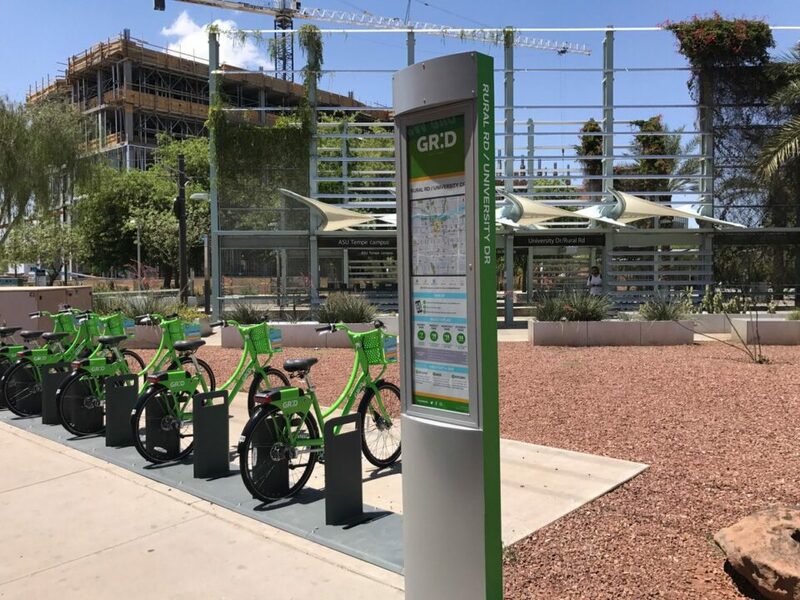 Tempe’s 30 stations will be located in high-activity areas such as downtown Tempe, along the light rail line, near Arizona State University’s campus and at community centers. Along with Tempe’s fleet, the Grid Bike Share program across the Valley will boast a total of more than 1,100 bikes at more than 100 hubs across three cities. The Grid Bike Share program was launched by CycleHop in Phoenix in 2014 and has been expanding regionally beginning with Mesa in early 2016. On September 8, 2016, the Tempe City Council approved a five-year contract with CycleHop to operate and maintain its system. CycleHop provides “smart bikes” manufactured by Social Bicycles, which are equipped with state-of-the-art features such as responsive solar lighting, chainless shaft drive, a GPS-enabled, solar-powered panel to interact with the bike and an integrated lock that also works with regular bike racks. Fare options include weekly, monthly, student and pay-as-you-go options. Bike sharing is a fun, healthy and affordable transit option for short trips or the first and last mile of a journey when paired with light rail and bus. Residents and visitors can quickly and easily access a public bicycle near places of employment, tourist destinations, educational institutions and transit stops. Bikes can be located and reserved via the Social Bicycles mobile app or online at www.gridbikes.com. Members can also unlock a bike directly at the hub using an account number and four-digit PIN code. To end a trip, the bike can be returned to any bike hub location in the valley or, for a small fee, can be locked at any regular bike rack. For more information about the program, visit www.gridbikes.com or download the Social Bicycles mobile application on Google Play or at the iTunes App Store.